786456 Driver John Greenwood, “C” Battery, 312th Brigade, Royal Field Artillery died of wounds 11 August 1917 and is buried at Vraucourt Copse Cemetery. He was 25 years old the husband of Mabel Annie Greenwood. He is commemorated on the War Memorial in St. Andrew’s churchyard, South Church, Bishop Auckland and on the memorial plaque in the Methodist Chapel, West Auckland. In 1901, the family lived at Newton Cap Bank, Bishop Auckland where John (father) worked as a coal miner (hewer). By 1911, the family lived at Newlands Avenue, Bishop Auckland where John’s father was a general dealer (grocer & draper) and 18 year old John assisted with the business. In 1915 John married Mabel Annie Chamberlain. 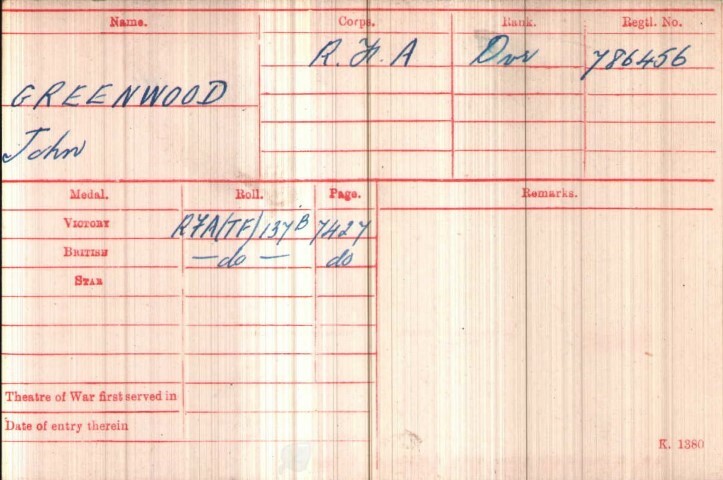 The service details of Driver J. Greenwood and the war diary of the 312th Brigade R.F.A. have not been researched. The 312th Brigade (CCCXII 2/III West Riding) came under the orders of the 62nd (2nd West Riding) Division. It was a Territorial Force 2nd Line and served with the 62nd Division from its formation in February 1915 to November 1918. Its original designation was 2/111 West Riding Brigade. 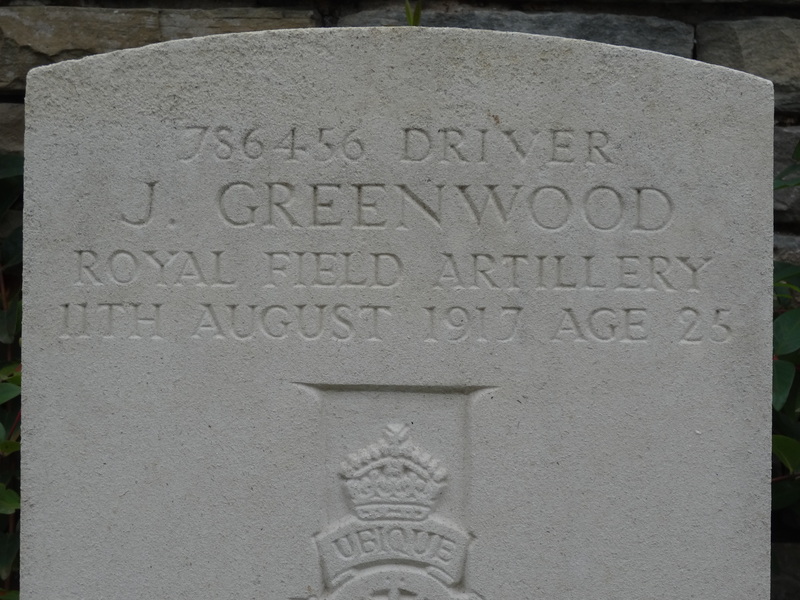 Driver J. Greenwood died of wounds 11 August 1917 and was awarded the British War and Victory medals. The 62nd Division was not involved in a major battle at this time thus it is assumed that Driver J. Greenwood was a victim of the usual violence of warfare.